Say a lot about your business without speaking a word – use our beautiful custom signs! When people visit or even pass by your restaurant, you have a chance to send a message. While you may do this through great service and a tasty array of menu selections, signs can also help. 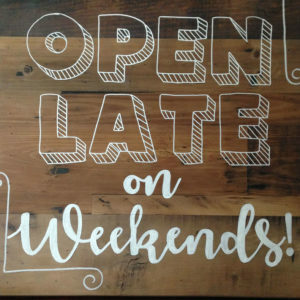 Whether you want to convey your establishment’s approach to service or give information about sales, hours of operation, or upcoming specials, signs are a great way to make a declaration feel important. Though our metal table tops can also be used for branding and promotion, we sell signs as standalone products to help you decorate your establishment with impressive looking designs and inform your patrons at the same time. When a person walks into your restaurant, what do they see? Clean amenities and friendly staff are a must, but what do their eyes focus on? In many cases it is the decorative items you have up on the walls and windows. Photographs and artwork are great for livening up a room and making the place feel more hospitable. But it’s also good to consider posting signs around your restaurant. What should these signs say? That depends on what your customer is thinking. Do they have questions about your establishment? And could these questions be holding them back from having the best experience? Signs can be used to display important information about the attitude your business has and the ambience it attempts to create. The same can be said about your policies, menu options, and sales. Having the appropriate signage posted can encourage hesitant patrons to stop on in, and even help newcomers make the journey to becoming regulars. You can show a lot about your restaurant, the team, and the management by the signs you have up. 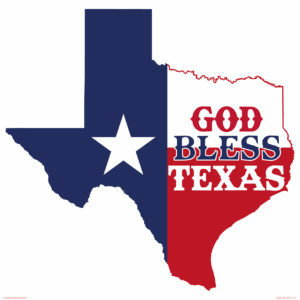 For example, our “God Bless Texas” sign shows off state pride and echoes a familiar adage wishing good fortune on locals. Share warm sentiments and make your patrons feel right at home – when they feel that way, they’ll eat accordingly. Are you open on weekends? Do you deliver? Can buyers mix-and-match sides on your menu? These are just a few of the questions you may get on a regular basis. By posting signs on the windows and even inside answering these questions, you make shy customers feel less hesitant about coming inside, having a seat, and enjoying what you have to offer. Do you have a famous dish that patrons just can’t get enough of? What about a big sale going on that you don’t want buyers to miss? Posting signs helps introduce a special or sale to a person gently without making it feel like you’re urging them along too much. Creating interest in a signature dish or a money-saving deal can be the best way to get a customer to partake.